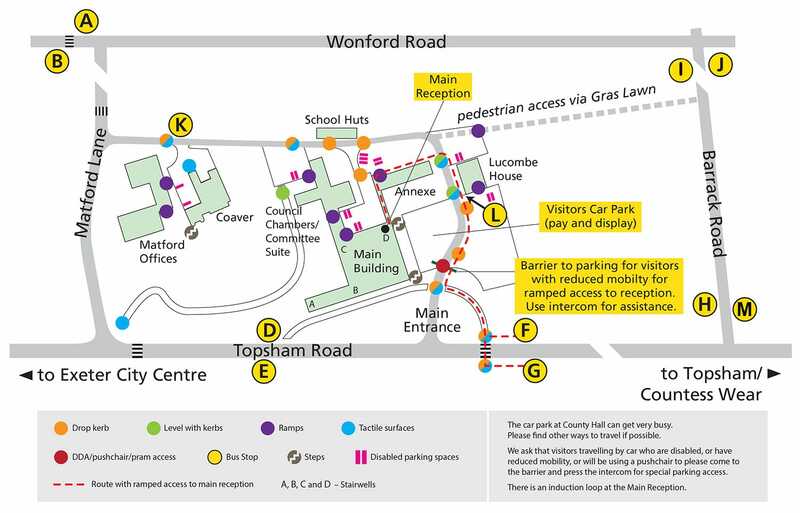 The car park at County Hall can get very busy so please find other ways to travel if possible. The postcode for County Hall is EX2 4QD. We ask that visitors travelling by car who are disabled, or have reduced mobility, or will be using a pushchair to please come to the barrier and press the intercom for special parking access. There is an induction loop at the Main Reception. The image below provides information about access to and around the site. All visitors are asked to report to reception. For further information, visit Travel Devon or use Traveline South West to help you plan your journey by public transport.